3 Sagrada Familia - Skip the Line! 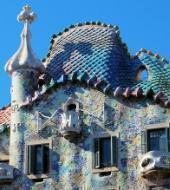 Are you interested in the architecture of Gaudí? This special pass is made for you! As part of the Gaudi Pass you will receive the tickets for 3 Gaudi’s pieces of art directly to your home via e-mail! Organize what you would like to see before your departure to Barcelona and enjoy the attraction without standing in the line! What is included in the Gaudí Pass? Skip the line tickets for the masterpieces of Gaudi - you will save the valuable time on your trip! Everything happens online! You do not need to change or pick up the Gaudí pass. Simply show your online ticket and enjoy! No time pressure! The card has no time limit, such as the Barcelona Card. Visit the buildings whenever you want and at your own pace! 20% discount on top museums, attractions, guided tours, nightlife and excursions. Please specify the dates of your visit while booking. Once you have booked, you will receive your personal discount code. With this individual code you get 20% discount for your next bookings of top museums and attractions from our extensive offer. Make the most out of your stay in Barcelona and book the Gaudí Pass!